Giving the gift of Aquaseal is to the regular outdoorsperson what the gift of socks or quality shaving razors is to anyone else; not exciting, but the pinnacle of practicality. It is not possible for me to have too much Aquaseal laying around. The uses are virtually innumerable, and too often when I want some the old tube is 1/3 full and mostly solidified. That’s the genius of Aquaseal, it’s an air-cure urethene glue, as well as the most frequent determinant of shelf life. So if you need a plainly unexpected gift this season, look no further. 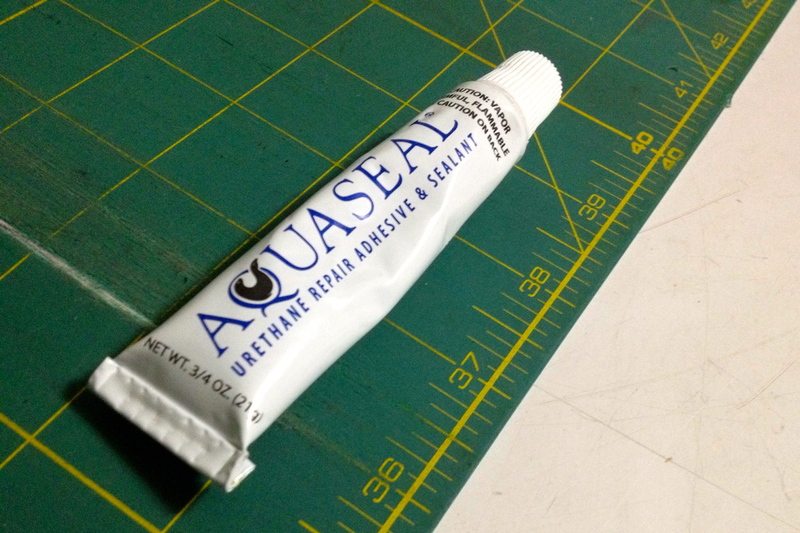 The obvious uses of Aquaseal are as well known as they are important: seam sealing anything with a PU coating (not Sil! ), adding traction stripes to the bottom of an inflatable sleeping pad (or the top), protecting stitch lines on shoes from abrasion, even gluing stuff on your packraft (though official urethene glues are more permanent), and of course patching holes in anything inflatable. My new favorite use, told to me by the folks at Seek Outside, is to thin it with a bit of mineral spirits, put said slurry in a syringe, and inject-seal the seams on your backpack. I’m not even going to say it again. How does the slurry hold up over time as compared to seam taping? Now I know what to fill your stocking with… if I wrap a pair of socks around each tube of Aquaseal, will it be the best Holiday ever??? Socks will be addressed later. Isn’t McNett Seam Grip more or less the same thing? I come almost exactly one year late to this post BUT a question: what am I meant to use for seam sealing? I thought it was clear silicone, possibly diluted with white spirits, but I see the word ‘urethane’ on the tube… I always used diluted silicone on PU treated cordura and XPac with good results. In theory sil should not bond well to PU or PET films. In practice it seems to do ok if used in dilute form and worked into seams. Aquaseal is a more reliable option in terms of UV exposure and longterm use.